For the second year, students in the School of Divinity course titled, “Liturgical Writing as Spiritual, Theological, and Prophetic Act,” collaborated to put together a published worship resource of prayers and poems. The course was led by Jill Y. Crainshaw, Blackburn Professor of Worship and Liturgical Theology. The syllabus presented a few guiding questions inviting course participants to explore what theologies they embody through their choices of language, images, styles, and forms in public prayers and written liturgies. What ideas, hopes, dreams, and laments do the words of worship spark or stir or set loose in our hearts and minds? What images of God swirl up out of communal prayers and hymns to shape what we believe or who we are as people of faith? The resource, Words Made Flesh: A Collection of Prayers and Poems for Worship, was a direct result of students embracing Crainshaw’s challenge with her guiding questions. Words are powerful and how religious leaders use words in worship matters. The experience of creating this resource also challenged students to consider their roles as public prophets, theologians, and spiritual leaders. 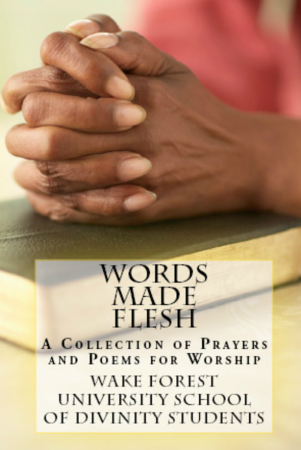 Words Made Flesh was designed and published by Library Partners Press at Wake Forest University. It is available for purchase in paperback from Amazon at http://wakediv.school/words-made-flesh. The idea behind Library Partners Press is to publish quality books (of any length and size, in both electronic and print-on-demand formats) created by Wake Forest University and North Carolina library patrons and friends. LP Press is a cooperative program established by Wake Forest University, the Z. Smith Reynolds Library, and Digital Publishing @ Wake, for the purpose of collecting, publishing, and delivering content created by library patrons everywhere. Learn more at https://librarypartnerspress.org/.